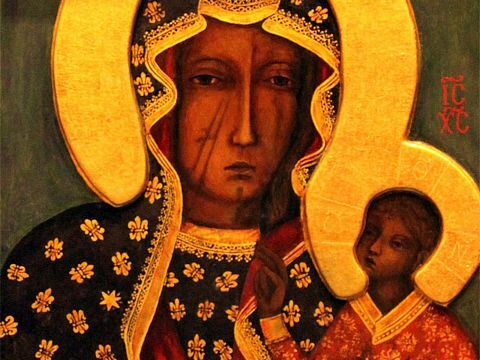 Nick-named “The Black Madonna,” Our Lady of Czestochowa was reputedly painted by St. Luke. Legend suggests that he painted it on a cedar table top from the house of the Holy Family. However, it was centuries of soot from votive candles in front of the painting that caused it to slowly turn black. It is said that St. Helena discovered it in Jerusalem in the year 326. She took it to Constantinople to present it to her son, Constantine the Great. It was then displayed for veneration by the public. Known also as the Queen of Poland, this great icon has preserved the faith of the Polish people and is believed to be responsible for miraculous interventions in the history of Poland. In 1382, the Blessed Virgin Mary appeared to Wladyslaw Opolczyk, Duke of Opole, advisor to Louis of Anjou, King of Poland and Hungary (who now possessed the painting), asking him to place it in the mountaintop monastery of Jasna Gora in Czestochowa. The prince did exactly as the beautiful Virgin Mary asked. The icon soon became the source of numerous miracles recorded in a book at the monastery. In 1430, the Tatars took control over Jasna Gora. The Hussites stormed the monastery in 1430 and plundered the sanctuary. They stole the treasured painting and carried it away. But when the Hussites placed it in their wagon, the horses refused to move. Frustrated, one man threw the painting to the ground and struck it with his sword. He inflicted two deep slashes on the face of the Madonna. When he tried to strike the painting a third time, he fell down in unusual agony and writhed in pain until he died. Artists have tried to paint over the slashes and fix the appearance of Blessed Mary, but the slashes refuse to be covered over with each attempt. After awhile they would strangely reappear. 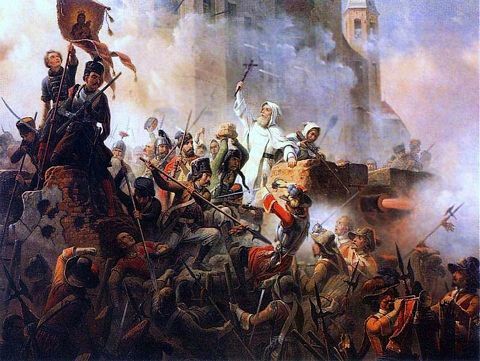 During the religious wars of the 17th century, the Protestant and Catholic powers vied for dominance in Europe. In 1655, King Charles X Gustav of Sweden launched an invasion known as the Deluge. Protestant Swedish soldiers soon overran Catholic Poland, desecrating churches and plundering the countryside. 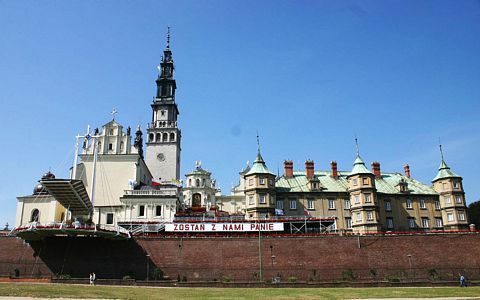 The monastery of Jasna Gora (Polish for “Bright Mountain”) stood like a bastion in the medieval city of Czestochowa, the last remaining holdout. The King of Sweden ordered General Burchard Miller to take over 2,250 soldiers and 19 cannons to take this last fortress. Jasna Gora only had 70 religious, a handful of nobles and their servants, plus 160 infantrymen. 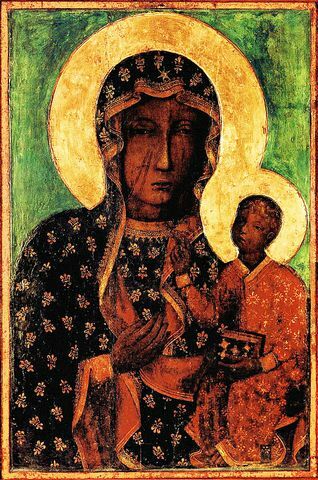 But they also had Our Lady of Czestochowa – the “Black Madonna” painting. Father Augustyn Kordecki struck the thick table with his clenched fist, “We must NOT let them take her!” Others agreed and stood firm to defend her with their lives. The monks unanimously approved, “It is better to die worthily than to live impiously.” Father Kordecki encouraged everyone to believe that the Blessed Virgin “who in such an extreme necessity would not fail them with her help.” He ordered that the Blessed Sacrament be carried in procession along the walls and bastions. 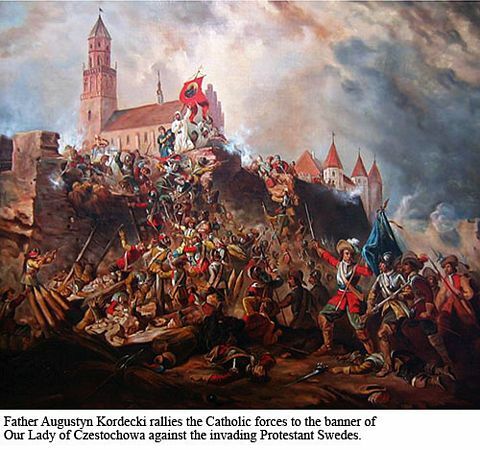 Father Kordecki personally blessed the cannons, cannonballs, bullets, and barrels of powder. 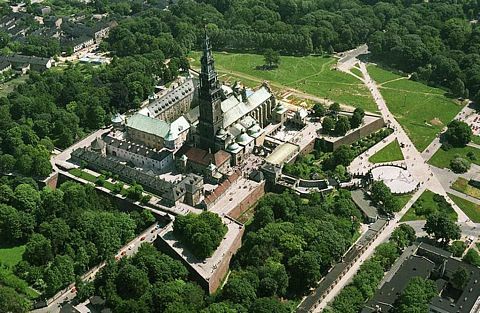 Infuriated, the Swedish Protestant army began a furious assault for three days on Jasna Gora. Yet, in the midst of the noisy bombardment, a pious and sacred hymn was mysteriously heard coming from the height of the tower of the sanctuary. None of the religious were responsible for this supernatural music. This encouraged the defenders to fight even harder! From that time on, it was typical to hear the beautiful hymns emanating from the majestic tower during fierce battles. Frustrated by failed efforts to acquire a treaty or surrender, General Miller stepped up the attack with a brutal bombardment of the monastery. It was like “hell itself was vomiting against the sacred icon.” Meanwhile, the monks carried the Holy Eucharist in a procession along the walls with cannoballs flying right past their heads. With winter coming on harshly now, the Swedes had to light bonfires at night to stay warm – making them easy lit-up targets for cannonfire to strike from Jasna Gora. Their movements also showed up easily against the white snow, adding to their vulnerability to be targeted. At one point a fog helped the Swedes to secretly advance. But a monk chose to “cry out for help from the powers of God against the spells of the enemy.” This tactic cleared the fog away and exposed the Swedes again. With the Swedes getting some reinforcements and bigger guns from Krakow, the attack became fiercer on Christmas Day. Cannonballs actually broke through the walls and bounced around the corridors and stairways, creating must debris and dust. By sundown the biggest gun was mysteriously silenced. An eyewitness reported that the last shot from the cannon had bounced back from the wall, hitting the cannon and destroying it as well as killing the gunner. The celebration of Christmas was never interrupted by war. The Swedes finally retreated, stating that Jasna Gora had been defended “miraculously.” General Miller revealed later that what convinced him to withdraw was a strange visit by a noble lady. Her words and menacing face severely warned him. This was undoubtedly the Blessed Virgin’s visit to him. Other stories surfaced from the Swedes of sightings of the Virgin Mary. “General Miller observed with great attention, here in the church, the picture of Our Lady of Czestochowa, and since his interpreter asked us to give him a small copy of the image, we gave it to him, and Miller took it from his hands. Thus it became clear to us that General Miller wanted to find out if the vision he had seen that night was similar to the picture”. The King of Poland then proclaimed the Blessed Virgin to be the Queen and Mother of Poland in an elegant and emotional declaration. On September 14, 1920, the Russian army was camping on the banks of the River Vistula and was on the verge of attacking Warsaw. 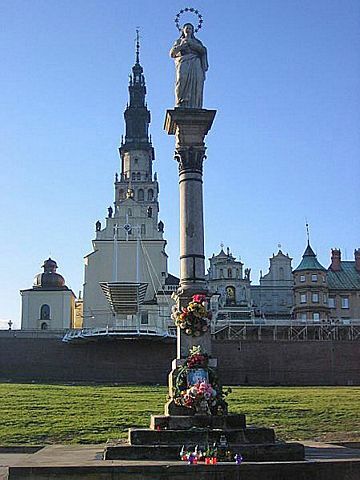 It is believed that the Russians changed their plans and withdrew when they encountered a vision of the Blessed Virgin in the skies over Warsaw. 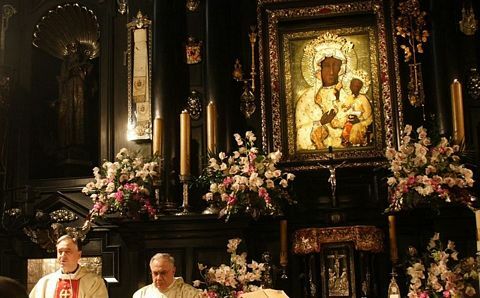 And when the Germans left Poland in 1945, they tried to blow up Jasna Gora and its precious icon – but without any success for some unknown reason.